Install and activate WP Ultimate CSV Importer Plugin. Create a .csv file for import, below is an example. If you don’t know how to create a csv file, copy the text in the box below then paste it into a text editor such as Notepad, then save the file as import.csv or see this page for more help. Each portfolio item is on a new line, edit the text to add your own portfolio items. "Portfolio item 1","This is the content for portfolio item 1","One|Two","http://demos.themecatcher.net/storm-wordpress/wp-content/uploads/2012/08/sand_70.jpg"
"Portfolio item 2","This is the content for portfolio item 2","Two","http://demos.themecatcher.net/storm-wordpress/wp-content/uploads/2012/08/ocean_70.jpg"
"Portfolio item 3","This is the content for portfolio item 3","One|Two","http://demos.themecatcher.net/storm-wordpress/wp-content/uploads/2012/08/waterfall_70.jpg"
"Portfolio item 4","This is the content for portfolio item 4","One|Two|Three","http://demos.themecatcher.net/storm-wordpress/wp-content/uploads/2012/08/rays_70.jpg"
The columns are explained in more detail below. 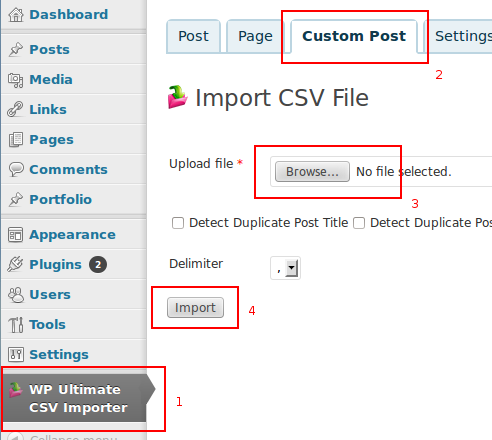 Go to WP Ultimate CSV Importer on the WordPress menu and click the Custom Post tab. Browse to the location of the .csv you created and click Upload. 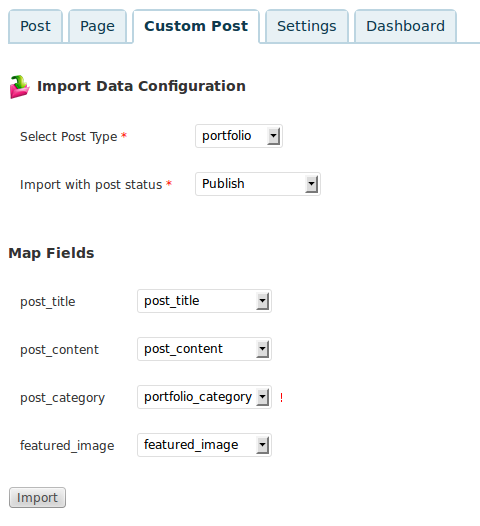 Set the options as shown in the screenshot below, Make sure you set the post_category to map to portfolio_category NOT post_category . Click Import and the portfolio items will be added.